Returning to Bookstores After 30 Years! HARD CASE CRIME to publish definitive edition of WEB OF THE CITY – Acclaimed author Harlan Ellison has authorized the publication of a new edition of his first novel, Web of the City, by Hard Case Crime, the award-winning line of mystery novels from editor Charles Ardai and publisher Titan Books. The new edition, which will feature not just the definitive text of the book but also three thematically related short stories Ellison wrote for the pulp crime magazines of the 1950s, will mark the book’s first appearance in stores in three decades. Harlan Ellison is one of the most renowned authors of the past 60 years. Although best known for his fantasy and science fiction and his always controversial essays, Ellison has also won the Edgar Allan Poe Award twice for his crime fiction. Other honors he has received include a record 10 Hugo Awards, 5 Nebulas (including the lifetime Grand Master Award), 6 Bram Stoker Awards (including their lifetime Grand Master Award), 4 Writers Guild of America Awards, and 2 World Fantasy Awards, as well as multiple other lifetime achievement awards. He has also been a finalist for the Emmy and twice for the Grammy. The film made of his life, Dreams with Sharp Teeth, starring Ellison, took 21 years to make, and is one of the most award-winning documentaries of the past five years. 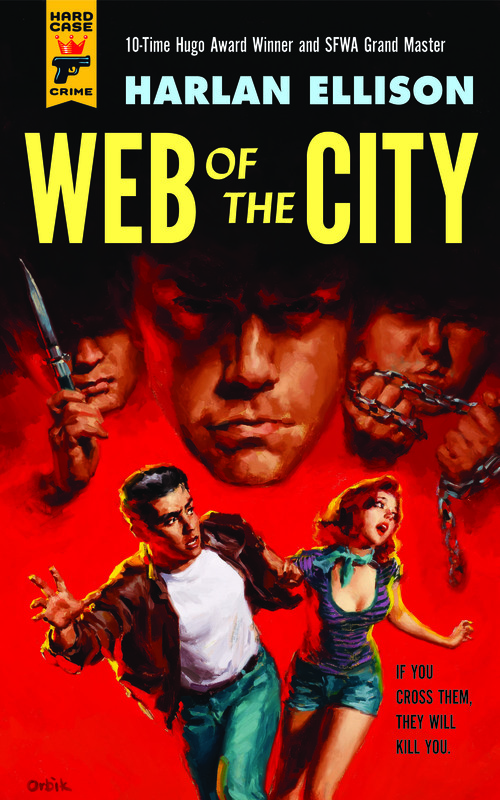 Written in 1957 while Ellison was enduring Army Ranger basic training in Georgia, Web of the City tells the story of a teenager who sets out to leave the New York City street gang he runs with, putting his family in grave danger. Ellison wrote the book after going undercover for ten weeks as a member of an actual Brooklyn street gang, the Barons, an experience that also inspired him to write the famous “Memo From Purgatory” episode of The Alfred Hitchcock Hour starring James Caan (The Godfather) and Walter Koenig (Star Trek). Hard Case Crime will bring the book out in April 2013, in paperback and e-book editions, with a new cover painting in the classic pulp style by Glen Orbik. About Hard Case Crime Called “the best new American publisher to appear in the last decade” by Neal Pollack in The Stranger, Hard Case Crime has been nominated for or won numerous honors since its inception including the Edgar, the Shamus, the Anthony, the Barry, and the Spinetingler Award. The series’ books have been adapted for television and film, with two features currently in development at Universal Pictures and the TV series “Haven” going into its third season this fall on SyFy.